Watermelon infected with fusarium wilt. Photo courtesy of Nick Dufault. 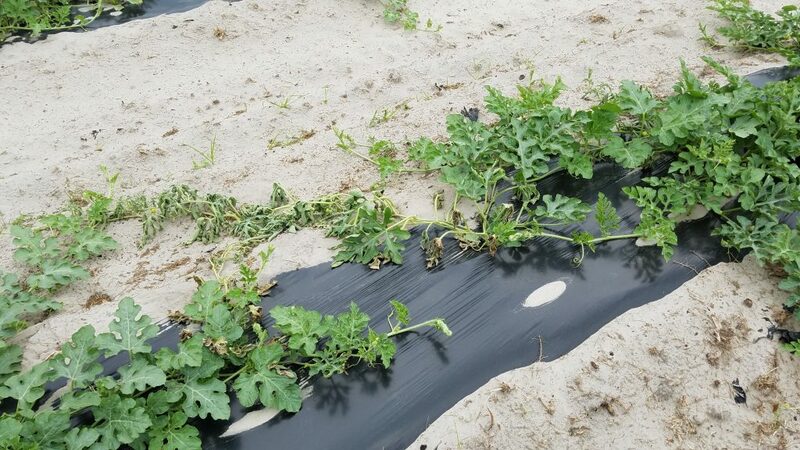 With multiple races that are increasingly aggressive, fusarium wilt has been a challenging disease for watermelon growers and a tough nut to crack for southeastern researchers. Nicholas Dufault, assistant professor and Extension specialist in the Plant Pathology Department at the University of Florida, says all races of fusarium wilt occur in Florida, but each is a little different. Fusarium wilt thrives in the soil and may come into a grower’s field via transplants or seed. One sign of the disease is wilting. When a plant is young, and the vines start to grow, one side of the plant will die. Then, within the next couple days, the entire plant could die. The fusarium wilt pathogen is deadly because it blocks the vascular tissue that moves water and nutrients to the plant. Although there is no cure for fusarium wilt, Dufault and fellow researchers stretching from Florida to the Carolinas have been working to find sound management methods. For years, growers have been told to practice good sanitation and crop rotation. “It all starts with healthy transplants and seed,” Dufault says. Limiting fusarium wilt’s presence on seed and transplants, and in the field can help reduce the probability of infections in a production system. Crop rotation is also an important tactic. However, if a grower uses crop rotation to reduce disease infection, Dufault warns that it can be a slow process for impacts to be seen, especially if the field is infected with a higher race of fusarium wilt. “If I was to visit a field two years ago and see they had race three, there’s still a good chance it’s there now even with crop rotation,” he explains. The use of resistant varieties is still a good option no matter which race of the disease is present. The downside is there are not many resistant varieties available to growers, so options are limited. The available varieties are only known to be resistant to race zero and race one of fusarium wilt, but Dufault says researchers are studying how much of an impact these varieties have on race two and race three. Fumigation is an option to manage fusarium wilt. However, the level of disease reduction is dependent on how and how much fumigant is applied. Research is being conducted on this. Fumigation can also help with nematode management, which growers may need if fusarium wilt is detected. According to Dufault, he has seen a pattern that indicates nematodes and fusarium wilt may occur together. “Whether that’s because they’re making wounds for the disease to get in or how they’re moving, we don’t know for sure,” he explains. Dufault has also completed some fungicide trials that have shown success. He says the key is to make sure the fungicides are getting where they need to be, which is in the root zone. Grafting is another management tool that growers can employ. Dufault has seen great results from his grafting studies. “When they (the growers) do grafted plants with the right rootstocks, we see pretty much immunity of that disease out there,” he explains. He adds that he hasn’t seen a difference in grafting results among the fusarium wilt races. Dufault warns, though, that if using a squash rootstock, growers need to be on the lookout for squash bugs. “That became an issue for a few producers, where the bugs will feed on the rootstock,” he says. One of the key management methods is adjusting planting dates. Dufault has found that planting later than usual seems to have a big effect on the fusarium wilt pathogen. He believes soil temperature has an impact, despite the connotation that fusarium wilt is a warm-weather pathogen. “That (the warm-weather season) could just be when we’re seeing those wilting symptoms come in,” he explains. According to Dufault, it seems as if the soil temperature becomes too warm under the plastic mulch for the pathogen to survive as the season goes on and the temperature increases. “So, in February, March or later in the season, we see our bed temperatures come up, especially when we have a lot of sunlight. We really want to reach the 86- to 90-degree range in the beds,” he says. Dufault notes that this tactic is dependent on the weather. Last season, Florida growers experienced more rain and cloud cover, so later planting dates did not have the same effect. If growers have any questions about fusarium wilt or want their field tested, they can contact Dufault (nsdufault@ufl.edu) or their local Extension office. This article was featured in the April issue of VSCNews magazine. 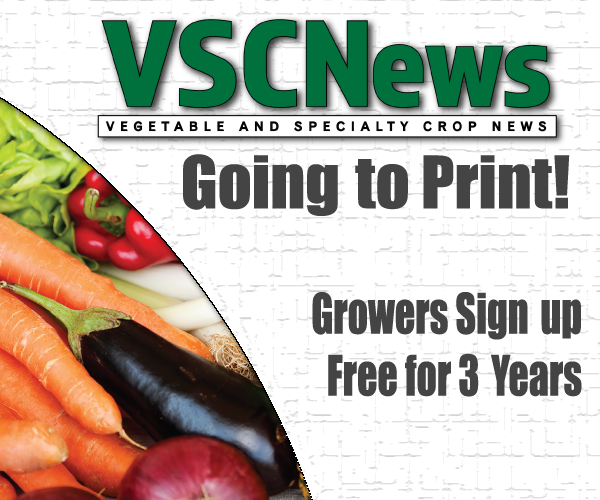 To receive future issues of VSCNews, click here.